When Jacques Cartier, on June 20, 1534, discovered L'Isle St. Jean, the present Prince Edward Island, he found the trees there "Marvellously beautiful and pleasant in odour - cedars, pines, yews, white elms, ash trees, willows and others unknown. Where the land was clear of trees it was good, and abounded in red and white gooseberries, peas, strawberries, raspberries, and wild corn, like rye, having almost the appearance of cultivation. The climate was most pleasant and warm. There were doves and pigeons and many other birds." Since then North America has been settled almost entirely by peaceful pioneer groups and individuals, mainly seeking greater freedom, either civil or religious, or wider opportunities for economic advancement. They and their descendants have, in three centuries, transformed a continent. They found a wild waste of dismal swamp and gloomy forest, abode of stealthy savage and majestic deer; treeless plain, alternately scorched by summer's blistering sun and chilled by winter's bitter blast; dark forbidding mountain, temple of mystery. Where once the buffalo roamed in thundering millions the settler now garners crops of golden corn. The iron rail and metalled road displace the labored oar. Nature has been subdued and broken by the will of man, and today these wastes of yesterday provide the happy home of many millions. The cost in human toil and anguish of this, an accomplishment so stupendous, can be estimated only by such as reckon the vast number of those that shared the toil and now lie sleeping in Earth's bosom. Tour of the Western Islands" made with Johnson in 1773, refers to the eager enthusiasm of the people to emigrate to the American Colonies. Up to this time no emigrant from Skye had ever gone elsewhere than to North Carolina. Many people in the Belfast district in Prince Edward Island, are kinsmen of the Scots in that State. In 1771 James Macdonald, merchant, Portree (Skeabost), and Norman Macdonald of Slate (Scalpa), for themselves and on behalf of Hugh Macdonald, of Armadale, Edmund Macqueen, John Betton, Alexander Macqueen of Slate, Rev. William Macqueen of Snizort, and Alexander Macdonald of Cuidrach, in Skye, petitioned the King's Majesty in Council for a grant of 40,000 acres of land in North Carolina, upon the usual terms and conditions of such grants. The petition was dismissed 19th June, 1772, by the Privy Council Committee on Plantation affairs on the ground that it was not desirable that so many people should leave the country. The Revolutionary War put a temporary stop to the exodus to North Carolina. The Colony, however, was established firmly, and friends in the homeland soon began to join their kinsmen beyond the seas, regardless of the political separation from the Motherland. The social unrest at the time of the American and the French Revolutions and the economic depression during and after the Napoleonic Wars, added further incentive to the already all-too-eager desire to emigrate, and by 1805 large numbers were departing to join their relatives and friends in the Carolinas. During the period of this great emigration the Army claimed many recruits, and Skye men played a great part in deciding England's destiny on the field of battle. From about 1797 to 1837 it is computed that ten thousand private soldiers, six hundred commissioned officers under the rank of Colonel, forty-five Lieutenant-Colonels, twenty-one Lieutenant-Generals and Major-Generals, and one hundred and twenty pipers from the Isle of Skye were in the British Army. Skye, during the same period, gave four Governors of British Colonies, one Governor-General of India, and one Adjutant-General to the British Army In the Battle of Waterloo it is computed sixteen hundred Skyemen fought in the British ranks. In 1771 Thomas Douglas, youngest of the seven sons of the 4th Earl of Selkirk, was born. By 1799 his father and all his brothers were dead and he had succeeded to the title. He was destined for the law, and in Edinburgh was an associate of Jeffrey, Fergusson, Scott, and others of the leading spirits in that shining age. He was deeply interested in the problems of his time, and longed to ameliorate the hard lot of his fellow countrymen. He spent ten years abroad in travel and study, and in 1802, on his return home, proposed a national scheme designed to remedy the social unrest. The next eight years, from 1802 to 1811, were spent by him in an effort to divert the tide of emigration from the Carolinas to Eastern Canada. Thereafter his life was occupied in his endeavors to found the Selkirk Colony on the banks of the Red River. He wished his fellow countrymen to establish themselves in circumstances providing full scope for their industry, and under the British flag. He first directed his efforts to Prince Edward Island. Three ships were chartered and about eight hundred passengers embarked to found a new home on his estate on this island. The "Polly" had the greatest number of passengers, most of whom were from Skye. On her was Dr. Angus MacAuley, agent for Selkirk. She arrived in Orwell Bay, Prince Edward Island, on Sunday, August 7, 1803, and disembarked her passengers near the present Halliday's Wharf. The "Dykes" arrived on August 9, and the "Oughton" with the Uist men on August 27. At this time the total population of the island was but little over five thousand. Selkirk, who was a passenger on the "Dykes," had planned to arrive before the others so that preparations might be made for their reception, but before he appeared on the scene the "Polly" had disembarked her complement. "I arrived," he writes, "late in the evening, and it had then a very striking appearance. Each family had kindled a large fire near their wigwams, and round these were assembled groups of figures, whose peculiar national dress added to the singularity of the surrounding scene. Confused heaps of baggage were everywhere piled together beside their wild habitations, and by the number of fires the whole woods were illuminated. At the end of this line of encampment I pitched my own tent, and was surrounded in the morning by a numerous assemblage of people whose behaviour indicated that they looked to nothing less than a restoration of the happy days of Clanship-" To obviate the terrors which the woods were calculated to inspire, the settlement was not dispersed, as those of the Americans usually are, over a large tract of country, but concentrated within a moderate space. The lots were laid out in such a manner that there were generally four or five families, and sometimes more, who built their houses in a little knot together; the distance between the adjacent hamlets seldom exceeding a mile. Each of them was inhabited by persons nearly related, who sometimes carried on their work in common, or at least were always at hand to come to each other's assistance. "The settlers had every inducement to vigorous exertion from the nature of their tenures. They were allowed to purchase in fee simple, and to a certain extent on credit; from fifty to one hundred and fifty acres were allotted to each family at a very moderate price, but none was given gratuitously. To accommodate those who had no superfluity of capital they were not required to pay the price in full till the third or fourth year of their possession. "I left the Island in September, 1803, and after an extensive tour on the continent, returned in the end of the same month the following year. It was with the utmost satisfaction I then found that my plans had been followed up with attention and judgment. "I found the settlers engaged in securing the harvest which their industry had produced. They had a small proportion of grain, of various kinds, but potatoes were the principal crop. These were of excellent quality, and would have been alone sufficient for the entire support of the settlement." That his schemes of settlement were to be a panacea for all the ills disturbing the State was not the expectation of the generous-minded Selkirk. "I will not assert," he says, "that the people I took there have totally escaped all difficulties and discouragements, but the arrangements for their accommodation have had so much success that few people perhaps in their situation have suffered less, or have seen their difficulties so soon at an end." Although the circumstances under which Lord Selkirk settled the Red River district in Rupert's Land, and the Belfast district in Prince Edward Island had much similarity, the peculiar isolation under which the Red River settlers lived for upwards of sixty or seventy years led to an intense loyalty to the founder of the colony, and to the colony itself as a social and political institution. A thousand miles of wilderness, of lakes, forests, and rivers, lay to the east; the great plains to the south and west, occupied by warring tribes of hostile Indians. There was left one road only of ingress to and egress from the colony. This meant a trying journey by boat and canoe from the settlement through Lake Winnipeg, and the Hayes or the Nelson River to Hudson's Bay. From there, an ocean voyage in stormy ice-beset northern latitudes to England. All but the bravest shrank from such a journey. From 1812 until 1870 the Selkirk colonists on the banks of the Red River lived largely unto themselves, and to this day they are as loyal to the Selkirk settlement and to the Selkirk tradition as is any Highlander to his clan chief. Not so the Selkirk colony on Prince Edward Island. Three years before they arrived the total population of the Island was about five thousand; that of Charlottetown about two hundred and fifty to three hundred. Only a few miles distant from them to the north, a settlement of Loyalists from the American colonies had been founded along Vernon river in 1792. They preferred to endure the hardships incident to founding a new home in the virgin forest under the flag they loved, than live under a government they regarded as alien to the political principles they espoused. The Selkirk colonists, after a generation, ceased to look upon themselves as a separate institution, and merged their lives in the larger life of the little province in which they lived. Today the Selkirk tradition is largely forgotten except by those who pursue it historically for intellectual diversion. In culture and civilization the Scots and Irish were much behind the English. Even to this day they have not reached the same degree of culture as their more wealthy neighbors. Owing to the poverty of his country the Highlander is unable to acquire many of the comforts essential to cultural development. From a state almost bordering on naked barbarism, in a comparatively short time, they had settled down to an ordered social life. Even before the great migration began after "the Forty-five" raids on neighboring clans to avenge either some real or fancied personal or clan injury, or to fill the empty larder, had become of but infrequent occurrence. Steady unremitting toil is alien to the Highland nature. The drudgery of the farm makes less appeal to him than does work in the mysterious forest, on the changing ocean, or in any other calling responsive to a spirit emotional and imaginative. His highly sensitive and superstitious nature, tinged with brooding melancholy, requires change and diversity. As a consequence we find him at his best in a vocation which appeals to his restless spirit, and makes frequent calls upon his ardent sentiment and ready intuition. Seafaring, because the Viking ancestral spirit is in his blood, and the learned professions, because of the diversity of work, suit him best. In these he has been a notable success, and has left the imprint of sturdy Scottish character and Scottish integrity upon society in every part of the world in which his lot has been cast, and where duty has called him. How much these qualities in the Scot have had to do with the success of the major public enterprises in Canada is a matter of interesting speculation. The Scot himself may claim the chief honor. Many others will willingly grant him a very large share of the credit where success has been achieved. Certainly in the opening up and development of Canada, and of Western Canada in particular, the Scot has played a dominant part. In the City of London, under the presidency of that swashbuckling ruffian, Rupert of the Rhine, there was incorporated on the 2nd of May, 1670, "the Governor and Company of Adventurers of England trading into Hudson's Bay." Being primarily fur traders this Company strove to retain for themselves, as was their legal right, exclusive control of the trade of the vast territories granted to them. They always looked askance at settlement, and regarded with jealous eye the advent of anyone from outside their employ. It is true that their policy retarded the settlement and development of the country for generations, and that of late years it has been the practice, though an unworthy one, to disregard their monumental services to Canada, and, ignoring history, to condemn the Company, as if in their long and enviable record there was nothing to commend. In the annals of trade and commerce the name "Hudson's Bay Company" will ever stand apart, conspicuous alike in romance of origin and honorable achievement. A beacon of honesty for more than al quarter of a thousand years, it has stood between the rapacity of the white man and the credulity of the simple minded native, to whom it has ever been the visible token and symbol of justice, of humanity, and of fair dealing. The "true and absolute Lords and Proprietors," it set and adhered to a fixed standard of barter between itself and those over whose lives it was Destiny personified. By frugal distribution it raised the supply of food and clothing, the absolute necessities of human life, from precarious uncertainty to definite certainty, and thereby saved the simple minded native from the misery and degradation of alternate feast and famine. To the poor Indian, whose standard of living has been fixed by an unchanging system of just and honest exchange for hundreds of years, the advantage has been incalculable. The assurance of certain and ample reward for service, the unvarying justice, the fixity of value in the system of barter, raised him from a creature of momentary splendor and as swift poverty, to definite self respectability and dignity. Nor has the world ever seen a more fitting and constant appreciation and return for paternal care and self assumed responsibility on the part of the Company than it has received from its willing wards during the full course of its beneficent history. True to its watchword -pro pelle cutem - the Company soon became, as indeed it was and continued to be in the person of its agents, the physical symbol of justice, order and authority. In place of the frequent outbreaks of cruel lawlessness and open warfare between the red and the white man, so common in regions less fortunately governed, and not so far distant, there is here presented the spectacle of an institution, with posts scattered over a territory ranging from two thousand to three thousand miles square, manned by a few whites, living with the natives not only in peaceful harmony and perfect safety, but on terms of willingly admitted superiority and authority. Nor in the long history of the Company has this moral authority ever been challenged. Rarely, if ever, has the fair name "Hudson's Bay Company" been besmirched by cruelty, injustice or fraudulent practice. Never has the sovereign power of which it was the visible agent, been demeaned in the eye of the credulous native by any lawless act of theirs. Not by statutory authority, but rather by humane treatment and fair dealing, did it become the living symbol of British authority, and of British justice, and as such was it recognized by them. In estimating the honorable part which this great Company has played in preserving huge territories to the nation, and attempting to hold other valuable areas which were lost through causes not within its control, tribute in unstinted measure must be paid to that noble band of Scots who, since they first entered the e Company's employ to the present day, have been recruited and sent overseas to man those remote outposts of Empire in the hidden wastes of a vast continent, unseen and unheard except by those whose destiny they held in sacred trust. Whatever the future may hold in store for fair Scotia, those of her blood may look back with unfeigned pride upon the record of her sons' great share in guiding the Company's affairs with success so signal, and in moulding the early life of a new nation on the sure footing of justice, law and order. This humane and historic Company, throughout its whole career, adapted itself to changing circumstances and surroundings. It assumes new shape and form to meet the varied circumstances of the passing hour, and thus lives on, symbol of an honored past and inspiration to a greater future. Intimately connected with this Company is that other great institution carried on with unvarying success through a period of over a century by men largely of Scottish blood and tradition - The Bank of Montreal. It commands a position of the highest honor not only in Canada, but in the world. The cardinal policy of this bank through the whole course of its long existence has been never to compromise fundamentals for any questionable gain, however great. On this firm foundation the sagacity of its directors and managers has built up an institution which today is an honor to the foresight of its counsels, to the character of the people, and to the Government of Canada. The same Scottish tradition inspired the founding and guided the early operation of that other great institution, the Canadian Pacific Railway Company. The fact that men of Scottish race have fashioned these three world-encompassing institutions brings a glow of well merited pride to the cheek of everyone possessing Scottish blood. Being an enlightened reformer Selkirk threw the greatest possible responsibility on the shoulders of the settler, and "the industry of the individual settler was allowed full scope to exert itself." The Island had been divided into sixty-six Lots or Townships. In 1767 it was granted to various persons, some of whom were officers in the Army and Navy, others were merchants and members of Parliament. These Lots, which were acquired by ballot, went in some cases to one person, in others to several. When one person was to get a whole Lot his name alone appeared on a slip of paper, otherwise several names appeared on the slip as sharers in one Lot. Lot 57 fell to Sam Smith and Captain James Smith, R.N. of the "Seahorse." It later became part of the Selkirk Estate, and on the shore of this Lot the Scottish settlement was made in 1803. Lot 50, adjoining, fell by lot to Lieut.-Colonel H. Gladwin and Peter Innis. The various proprietors were required to settle the land, but few carried out the conditions of the grant. The quit rents to which these lands were subject were adjusted on the basis of 6s., 4s. and 2s. per hundred acres. For the first five years after the grant no quit rents were payable. For the next five years one-half the fixed rents were payable. After ten years the whole amount was payable. Even though these rents were later reduced, they were still an intolerable burden on the new settlers, and for generations there was a growing discontent with the leasehold tenure of land, culminating in an agitation of such intensity that it was not stilled until 1860, when the Government appointed a commission of enquiry. This led to the Government purchase of the land from the landlords, and the sale of it to the various purchasers. Leasehold tenure was changed to freehold, and with its assurance of permanency the owner had every incentive to improve his property. This he speedily did, with results so satisfactory that material prosperity and mental content advanced hand in hand. In 1860 the Selkirk Estates in Lots 53, 57, 58, 59. 60 and 62, containing 62,059 acres, were purchased by the Government for £6,386 17s. 8d. sterling, or £ 9,880 6s. 6d. currency. The settlement, afterwards called Belfast, a corruption of the French "La Belle Face," was founded on the abandoned site of a French colony whose members were deported to France after the surrender of Louisburg in 1758. Their settlement extended along the coves and creeks from the mouth of Charlottetown harbor to the Pinette River. A French naval officer who visited the various French settlements on the Island in 1752 reported that the number of settlers in this area was not less than five hundred. Later the whole territory from Vernon River to Wood Islands extending inland a few miles was, and is now known generally as, the Belfast District. The clearing had again grown up, but various evidences of the former occupation, the shallow well, the ditch, still existed. The old cemetery that knew the voice of the Cure, M. Gerard, with its pathetic reminders of the transitory career of man, was soon requisitioned by the newcomers to fill the purposes for which it was dedicated, and today former members of a district settled with similar hopes, but alien in race and religion, sleep in undisturbed repose within the sacred confines of the common hallowed spot. The majority of the 1803 settlers were from Skye, a fact of high significance. In that inhospitable island, from the dawn of its recorded history, was bred a race of men and women of unconquerable will and indomitable spirit. They were inured to hardship and unspoiled by luxury. Living in a land distant and inaccessible, they there maintained in their isolation, to an unusual degree, racial purity and distinctive racial characteristics. These qualities were carried across the seas to America, and there they were further developed. In the environment peculiar to their island, Skyemen developed into a military aristocracy undaunted by hardship or danger. Having been tried in the fires of adversity for generations they were a band well chosen to tame the arrogance of nature in the forests of Belfast. But this was not accomplished without toil and self-denial unknown to those who attempt a similar work in an age ministered to by all the comforts provided by modern science. The isolation of their new home, and the persistent intermarriage between members of the same stock, have tended to maintain those characteristics peculiar to them, to a degree almost unknown in other parts of English speaking Canada. Although the Belfast settlers were to a large extent isolated in their new homes, they never wholly forgot the land of their forefathers. In song and story, to this day, one finds constant evidence of the strong spiritual bond uniting the two islands, and the intense loyalty of the early settlers to the Skye tradition burns in the breast of the present generation with a flame as steady as it did in any that has gone before. All are haunted by the same dreams. The recent call to battle met a ready response, and many of the youth of Belfast sleep in "Flanders Fields" beside their Skye kinsmen, fired by the same purpose, all "brave sons of Skye." Thus was verified almost two hundred years after, the character ascribed to these people by the great Pitt (afterwards Earl of Chatham), in addressing the House of Commons, when he said: "I have sought for merit wherever it could be found. It is my boast that I was the first Minister who looked for it, and found it in the mountains of the North. I called it forth, and drew into your service a hardy and intrepid race of men; men who, when left by your jealousy, became a prey to the artifices of your enemies, and had gone nigh to have overturned the State in the war before last. These men in the last war were brought to combat on your side; they served with fidelity, as they fought with valour in every quarter of the globe." Perhaps no quality characterized the Scottish race more than their love of education. They realize, as few other peoples, that knowledge is the sesame that opens wide the magic door to a life of wider prospect with all the increased privileges and added sorrows that go with it. Every family strives to give higher education to at least one son. The parents and other children patiently undergo all the privations necessary to attain this desired end. The religious outlook of Scotland, of which their school system is an expression, has done more, perhaps, than any other agency to inculcate that proud spirit in the race which encourages the young to feel that there is no position in society to which the individual may not aspire. For this reason the Scot is distinguished for his independence, fearlessness, and self-reliance. As an organizer and administrator he is imaginative, far-seeing and resourceful. As an empire builder he is without a superior. In whatever part of the world one may go, wherever the English language is spoken, one finds in the forefront in every walk of life descendants of that sturdy stock of pioneers who owe their start in life to the sound example set before them in youth, of sobriety, industry and integrity. It may be expected that the Selkirk settlers brought with them to their new home this ardent desire for the better and higher things of life. If they could not have such for themselves they were all the more anxious that their children should have what they themselves were denied. During the first few years in the colony facilities for formal education were of the most meagre kind. Soon, however, well trained Skye schoolmasters opened up, in private homes, their little academies of learning, and here the neighboring children gathered, eager for instruction. The name of the first teacher is not definitely known, but it is alleged by some that the first school in the settlement was conducted in a log cabin in the Pinette district by Donald Nicholson, a Skye man, who arrived on the "Polly" in 1803. Others maintain it was beside the French cemetery. It was not until 1821 that the Government prepared to open national schools. In 1826 a general School Act was passed. It was re-enacted in 1830. Section four of said Act enacts that "any person who may be a candidate for the office of master or teacher in any grammar or district school within this Island shall, on one of the days of said meetings, or on such other days as any three of the said Board shall appoint, present himself for and shall submit to an examination of his qualifications in the following branches of education-that is to say, candidates for the office of master or teacher of any district school, in reading the English language, writing, practical arithmetic and the elements of English grammar; and for the office of master or teacher of a grammar school in the Latin and Greek classics usually taught in schools, the elements of English grammar, reading the English language, writing, arithmetic, practical mathematics and geography -And if the Board shall be satisfied with the candidate's proficiency, they shall give him a certificate of his having passed such examination which certificate shall express the nature of the school for which the candidate has passed examination." Prior to 1826 there were no prescribed subjects of study, but Mr. John Anderson, at present Provincial Auditor of P.E.I., who was born in Orwell Cove, recalls hearing in fireside conversation when a young boy, that reading lessons were given from whatever books were available. Needless to say the Bible and the Shorter Catechism were used most. The value to the pupil of daily instruction in the Bible by a man who prized it as a literary masterpiece no less than as an infallible guide to conduct, was priceless. The ether subjects, Writing, Spelling, Grammar, Geography, and Arithmetic were no doubt taught without the aid of textbooks. In 1823 Rev. John MacLennan became the incumbent in Belfast. From the day when that noble spirit arrived in the district until he departed from it, his strength was given without stint to aid and uplift those among whom he lived and labored. He soon opened a school at Pinette, and in addition to his many other arduous and trying duties, he taught there for years. Strange as it may seem, there were even then, in the humble homes of Belfast, pupils who craved a knowledge of the classics. Mr. MacLennan taught them Latin in addition to the ordinary subjects. His work was highly commended by John MacNeill, Inspector of Schools, in his report to the government, in 1841. 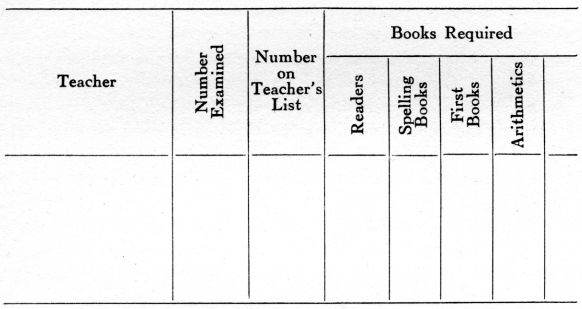 In reporting to the government in 1838 Mr. MacNeill uses a table which shows the limited curriculum of that time. Before two generations had passed the number of professional men coming from this district proved that the spirit of their forefathers had taken deep root in the soil of the new world. Many families contributed members, in some cases as many as seven, to the learned professions and to business life. No self-denial on the part of any member of the household was considered too great if thereby one of the family, who desired it, was enabled to pursue his studies at a seat of higher learning. Medicine and engineering were looked upon with great favor, and the career of any youth who entered one of these professions was watched with eager interest. The Church too was favored by many, and the early organization of a highly devotional congregation, presided over by ministers of wide knowledge and broad sympathy, did much to hold it in the esteem and affection of the people long after it had begun to lose its power in other parts. Few congregations of similar size have given as many sons to the active ministry of the Church. The highly imaginative Highlander, with his love of meditation, found in the pulpit a fitting medium to express without reserve, the intensity of the gloomy forebodings which ever characterized his theory of life and religion. Owing to the prospect, not always remote, of political preferment incident to the legal profession, it was looked upon by many as a most desirable calling. Coupled with this was the more fixed home life of those following this vocation. Its vagaries and opportunities for disputation made it congenial to the peculiar mental constitution of the Highlander, with his alternate periods of brooding melancholy and infectious gaiety. They were farseeing enough to recognize the high value of a legal training as a matter of mental discipline, and the consequent benefits accruing to the student of law in any calling one might choose. They also realized the great truth expressed by Edmund Burke, "The law is a science which does more to quicken and invigorate the understanding than all the other kinds of learning put together." It is not therefore to be wondered at that, with such an outlook on life, this district gave a large number of men of high integrity and skill to the bench and bar. But the great majority, as in other parts, were unable to attain a formal higher education. In the ranks of these, one finds men and women of the highest honor and fidelity, whose lives have been not only a credit to themselves and a source of pride to their families, but an honor to their native land.